When you build the scorecard for your company, you might consider using a template. Is this a good idea? In this bonus mini-lesson, we will discuss templates and what you can do with them. 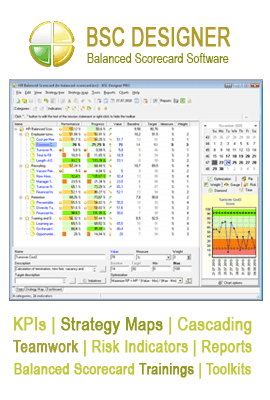 1) Ready-to-use templates include a library of pre-defined Key Performance Indicators. Be very careful about using indicators from these libraries. Your business is unique! You cannot solve your business problems or measure your progress using indicators designed for someone else’s business. You can consider indicators from template libraries as examples, and adapt them to your needs, but do not just copy them! 2) Graphical templates are easy to find, and they can be used for presentation purposes. We have some examples available for free on our website, www.BSCdesigner.com. Just remember, graphical templates are hard to calculate and update. They are useful for presenting your scorecard, but not for designing it. A good compromise might be to use Balanced Scorecard software that can help you create and manage your own Key Performance Indicators, and also help you generate attractive presentations once your Balanced Scorecard is complete. Our BSC Designer software, available at www.BSCdesigner.com, includes a freeware edition for novices, and a full professional version that you can try without limitations for 30 days.